Judy Lennington, then of Johnston, wrote her first novel after retiring in 2009 from a factory in Warren. 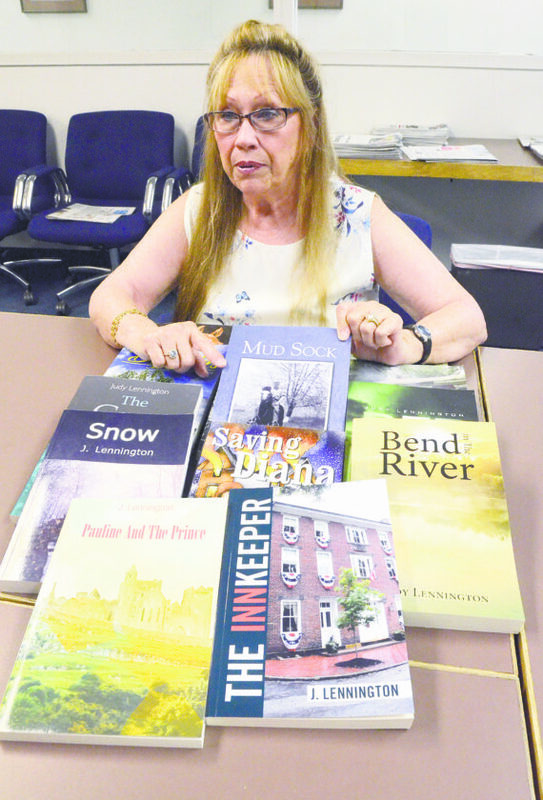 She’s just released her 14th book, “Bend in the River,” a historical tale set in Wellsville in 1847.
Credit Judy Lennington’s retirement career to a blizzard. It was the winter of 2009 and earlier in the year, the Johnston resident had called it quits at TechnoCap in Warren after 10 years. In all, she’d spent the past 38 years working factory assembly lines. Her husband, David, an avid reader and a history buff, hadn’t yet retired from TechnoCap. So while he was at work, Judy sheltered from the winter chill inside their house near Mosquito Creek Reservoir. “We got 18 inches of snow. I thought, ‘What am I going to do?’ So I decided to write a little story for him,” she said. The novel, “Saving Diana,” was set in the south-central mountains of Pennsylvania in the 1850s and 1860s. The title character, Diana Lewis, is one of six daughters living in a log cabin with parents William and Agnus Lewis. Everyday life gets turned upside down by the Civil War and advances such as the building of the Pennsylvania Railroad. Long after the snow melted, Judy Lennington kept writing. It was sort of a love letter to her husband. Judy polished up the manuscript and emailed it to four publishers. Two said no, one didn’t answer. The fourth, Dorrance Publishing Co. in Pittsburgh, sent her a contract. Lennington said the novel, released in February 2012, is her only traditionally published book. She’s self-published since at a rate of about two, and sometimes three, books a year. The latest release, “Bend in the River,” is her 14th, and the 15th book, “Equine Empire,” should be out by the end of the year. “I think if I would have started this at another time in my life, I don’t think it would have worked,” Judy said. It helps, David speculated, that she was born into a family of storytellers in Rogers in Columbiana County. “Everywhere she goes with her books, she meets people and gets ideas,” David said. The Lenningtons have moved back to Columbiana County, in East Palestine. A good deal of her novels are set in the small towns surrounding her. “I get inspired by all these little Ohio towns where there’s nothing there,” she said. “Bend in the River” is set in 1847 Wellsville, where 8-year-old Jack Gideon lives with his grandparents and father in a small house built from the wood of a raft on which his great-grandparents floated down the Ohio River. They settled where the river bends. In the “The Old Brick,” a postal worker in Negley solves an old mystery of missing children after a homeless family moves into an abandoned brick house across the creek. But she refuses to be limited by a single genre or a locale. “Deb” is science fiction about a woman trying to figure out who are the four strangers who appeared after she was zipped into a body bag after a traffic accident, and why can she now move objects with her mind and heal people with her touch. “Twin Mirrors” is a time travel book, “Equine Empire” will be the fourth book in a series — following “Snow,” “Daffodils” and “Blue Grass Dynasty” — focusing on a Kentucky thoroughbred horse breeder and his dysfunctional family, and “Pauline and the Prince” is set in medieval times. Her lone nonfiction book is the story of her father’s life. “Mud Sock,” which was the nickname given to a then-mucky Rogers, traces her father’s early life from his boyhood working horse-drawn deliveries to his landing on Utah Beach during World War II. She’s considering a sequel to pick up after the war. Judy said she’s often asked for advice from people who wish to be authors. But in the end, she said, it’s up to the writers themselves. And if you think you’re a little unusual, well, you are. Lennington’s books are available at online sites such as Amazon and Barnes & Noble, or by calling her at 330-219-7793. She also sells her books at various signings and festivals in the area throughout the year.